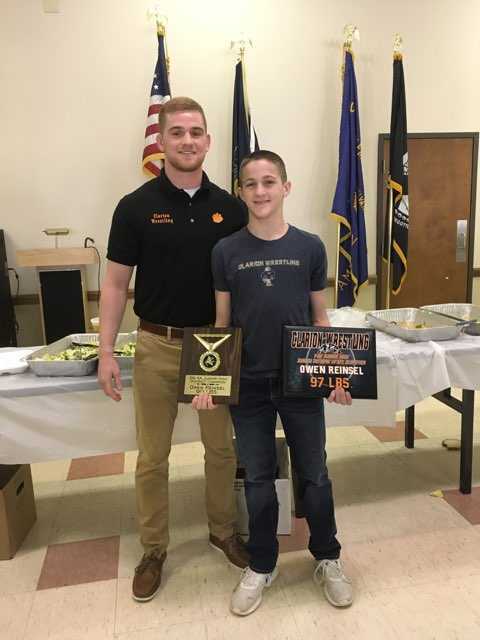 (By CSZ Sports Writer Kenn Staub) The Bobcat Wrestling Team held its end of the season banquet on Sunday, March 25 at the Clarion American Legion. 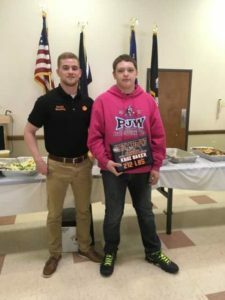 Attendees came together over a catered dinner of pulled pork and chicken breasts to celebrate team and individual accomplishments during the 2017-2018 campaign. 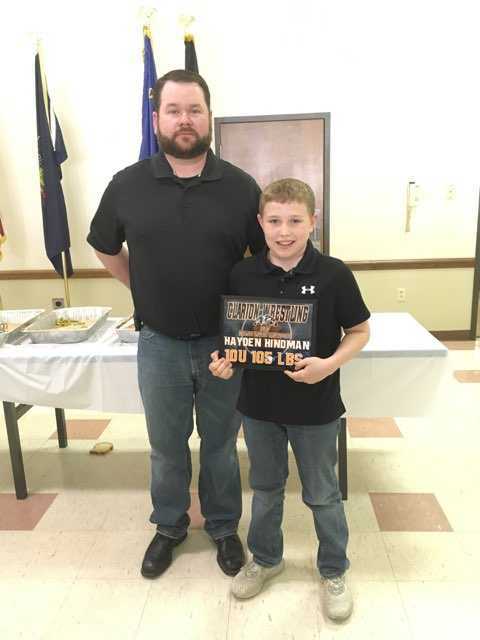 Dave Smail, representing the Clarion Elementary Wrestling Club, was on hand to recognize several young grapplers who had qualified to participate in the 2018 Pennsylvania Junior Wrestling state championship. 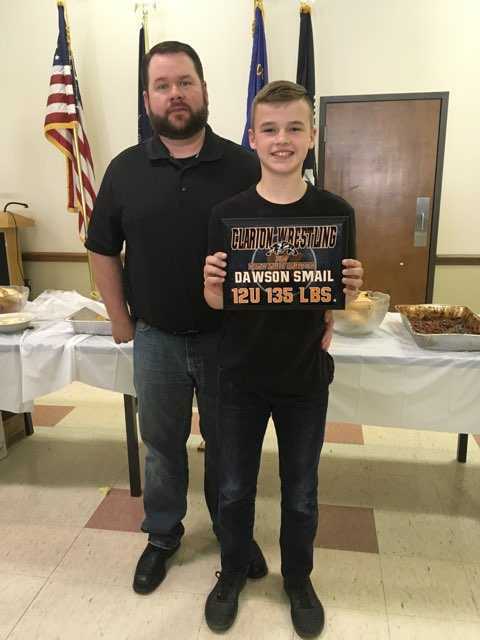 These included Dawson Smail, a sixth grader who competed in the 12u-135 pound class, fifth grader Derek Smail, wrestling in the 10u-150 pound division, Mason Gourley, a fifth grade competitor in the 10u-95 pound class, and fourth grader Hayden Hindman, who represented the club in the 10u-105 pound division. This was Dawson Smails’s and Hindman’s first trip to the state tournament, with Gourley having qualified for the second time. Derek Smail, a four time state championship qualifier, finished this year’s event on the sixth step of the podium. In addition to introducing the four state qualifiers, Mr. Smail spoke of positive things happening at the elementary level, noting that it is a good starter for eventually competing at the junior high and high school levels. As part of his remarks, he thanked high school head coach Brian Luton, senior wrestler Colton Rapp for his coaching assistance, and the Wrestling Boosters for their support. 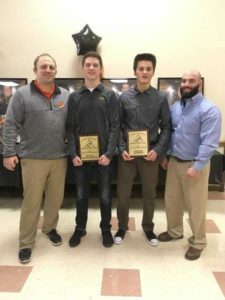 At the conclusion of Mr. Smails’s remarks, junior high coach Matt Liggett introduced his team, prefacing individual introductions by commenting that each of the wrestlers put in a lot of time, effort, and work throughout the season. 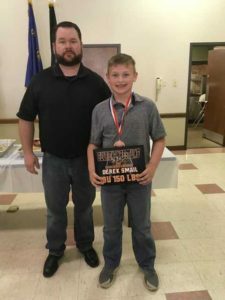 What follows is the name of each junior high wrestler and a summary of Coach Liggett’s comments. Ashton Rex…Rex was injured at the beginning of the season, but was able to take the mat by February. Liggett appreciated everything this young man did during the season. Brecken Rex…The older Rex brother had a long season. He put in a lot of hard work and pushed through the season. Ryley Mullaney…The goal at the beginning of the season was to see Mullaney get his first career win, which he accomplished with a pin against a Cranberry wrestler at the last tournament of the season. Liggett believes Mullaney will only continue to improve. Owen Reinsel…Reinsel wrestled hard and went undefeated in the tough 97-pound weight class. He claimed the District 9 championship at 90-pounds. Reinsel qualified for the PJW Junior High State Championships at 97-pounds, going 2-2 in Johnstown. Kaoz Baker…This was Baker’s first year on the mat. He learned a lot and wrestled with heart throughout the season, wrestling several exciting matches along the way. Baker took third place at 210-pounds in the District 9 Tournament. He also qualified for the PJW Junior High State Championships at 212-pounds, posting a 1-2 record at the tournament. Carl Welch…Liggett was proud to have Welch on the team, noting that he helped with the younger guys. Following his introduction of each wrestler, Liggett presented a variety of individual awards. 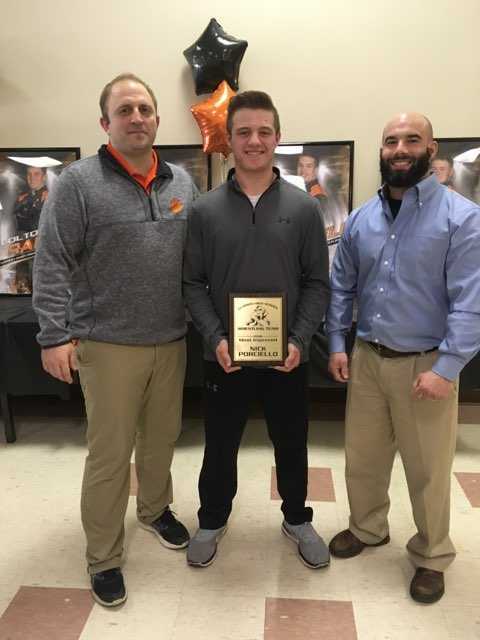 Reinsel was named Outstanding Wrestler. Baker claimed Rookie of the Year. Mullaney earned Most improved and Welch received the Coach’s Award. Liggett thanked the Wrestling Boosters, the parents, high school coaching staff, and his girlfriend for their support during a tough season that saw his small team claim few dual meet victories. He also announced that, as he will be graduating from Clarion University in May, this would be his last season as junior high coach. Liggett expressed appreciation for being given the opportunity to coach. Clarion High School head coach Brian Luton took center stage next, providing the audience with a recap of the 2017-2018 season. The Bobcats went 11-5 in dual meets, with the victory over Redbank Valley on Senior Night proving to be a highlight. Luton noted the team was always competitive and that somebody different always came through for the team at each match. Tom Wurster’s twenty-nine wins were the most of the season, as were his twelve pins and thirty-eight takedowns. Login Dehner posted a team high seventy-two points. Three grapplers found their names added to the all-time career wins list: Colton Rapp (74), Wurster (67), and Ryley McMasters (60). McMasters was a regional qualifier and Wurster advanced to the state tournament in Hershey. Luton then introduced his wrestlers, commending the parents for raising an awesome group of young men. He commended his wrestlers for being fun and hard working. The roster and a summary of what Luton had to say about each grappler follows. Login Dehner…Dehner is a hard worker who puts in a lot of time during the off-season. Luton looks forward to seeing what he does during his senior season next year. Colton Zacherl…Zacherl was a first year wrestler who Luton described as very athletic. Cutter Boggess…Boggess has high expectations for himself. He improved throughout the season. Frank Weber…Weber was described as a good leader, often running warm-ups and stretching. Despite injuries he battled all season. Luton referenced his win in the last bout of the Redbank Valley match, which decided the match in the Bobcats’ favor. Ryley McMasters…Luton referred to McMasters as a great young man and a role model. He was proud of Ryley’s accomplishments during his senior season. Colton Rapp…Rapp had some tough breaks the past two seasons, suffering injuries that caused each to be abbreviated. Despite not being on the mat, he was able to bring out the best in his teammates. Nick Porciello…Porciello improved almost daily and would give six minutes every match. Cam Boggess…Boggess works hard in both the wrestling room and the weight room, making a lot of progress on and off the mat. Seth Nellis…Luton commended Nellis for having an awesome attitude, no matter the situation. Colt Stimmell…Stimmell was described as an athletic wrestler who has battled injuries. Ben Smith…Smith is a hard-nosed, competitive wrestler. Luton commended him on being well-mannered. 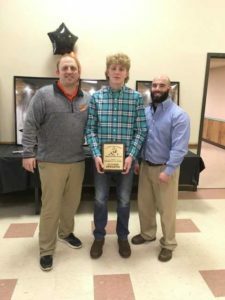 Tom Wurster…Luton reiterated Wurster’s accomplishments: posting a 29-9 record, finishing as runner-up at the District 9 tournament, beating rival Tyler Cook of Brookville on his way to finishing fourth at Regionals, earning a berth in the state tournament. Matt Coleman…Coleman is a hard-working, team player who Luton described as unpredictably predictable. After the wrestlers were introduced individual awards were presented. Cutter Boggess was named Rookie of the Year. 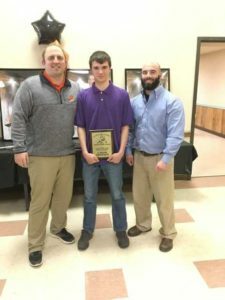 Dehner earned Most Valued Underclassman. 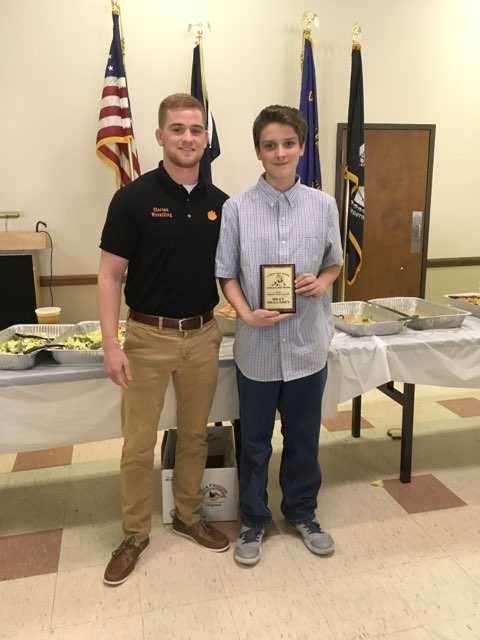 Porciello claimed Most Improved honors. Rapp received the Ted Lawrence Coaches Award, with Weber and McMasters sharing the Dave Weible Coaches Award. 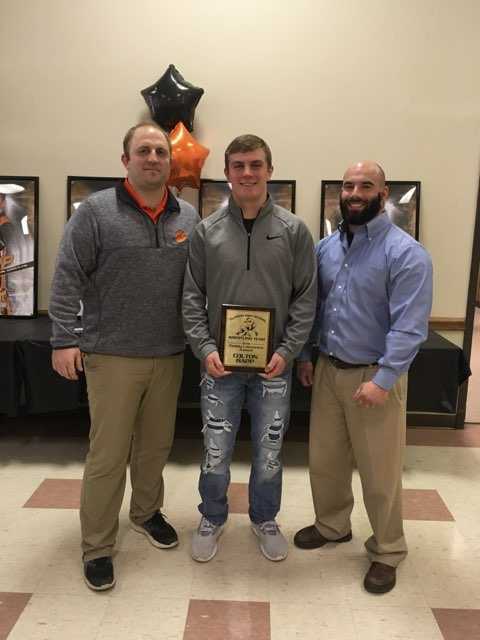 Wurster was this year’s Outstanding Wrestler. 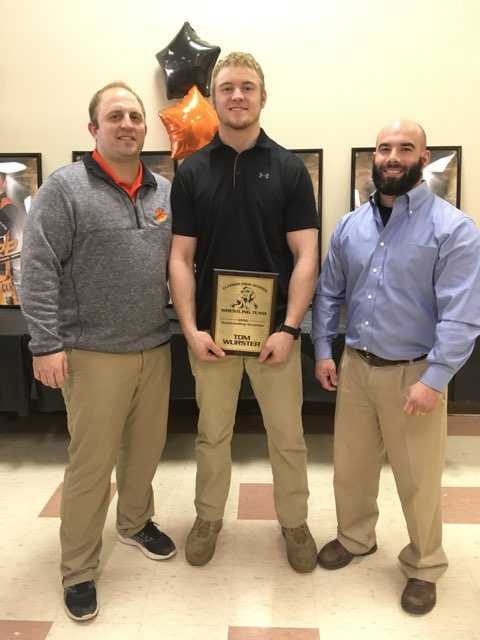 Luton thanked his coaches, Matt Watterson and Cameron Slike; the Wrestling Boosters for the support and providing for the wrestlers; and his wife, Ashley. Wrestling Boosters’ President Ron Rapp thanked all the parents, noting the contributions of Booster officers Angie Smith (Vice-President), Staci Wurster (Secretary), and Cindy Nellis (Treasurer). He then introduced the officers for the year ahead: new President Mike Dehner; Smith, who will be returning as Vice-President; incoming Treasurer Marci Boggess; and Smail, who will be assuming secretarial duties. 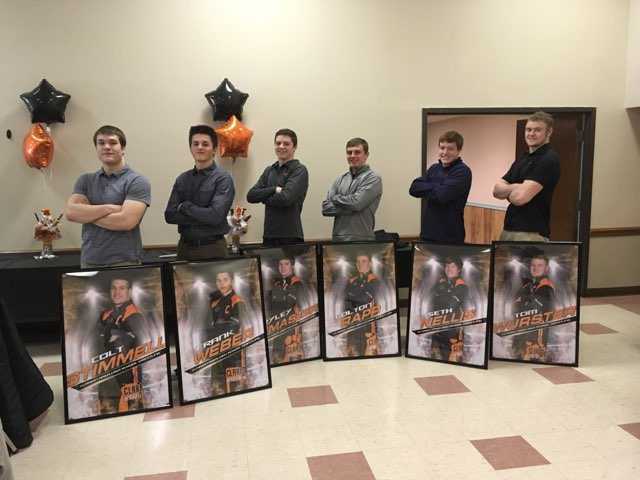 The evening concluded with the seniors presenting “gag gifts” to the coaching staff and a round of pictures.